" OpManager is the world's first, truly integrated network management software for faster and smarter network management. " Thanks for filling the form. You'll be redirected to the report. Info-tech's Software Reviews Data Quadrant Awards are awarded to recognize outstanding vendors in the technology marketplace as evaluated by their users. Top vendors in a software category are eligible to receive Data Quadrant Gold Medals, among whom ManageEngine OpManager bagged the second place. IT leaders, business professionals and end-users examined relative performance and gave us feedback for the following ranking criteria. ● Service experience: Customers say that OpManager's service experience is highly respectful, efficient, caring and time-saving. ● Product experience: Customers found our product reliable, productivity-enabling, performance-enhancing, secure and innovative. ● Pricing negotiation: Customers find us generous, transparent, and friendly. They think we promise less and deliver more. 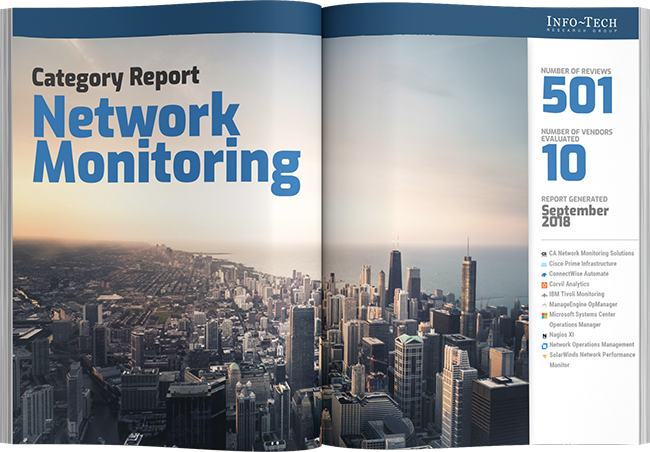 Check out OpManager's position in the quadrant and see for yourself where we stand in the network monitoring and management industry.